Today we're thrilled to share the cover of Kim Harrington's upcoming middle grade novel, REVENGE OF THE RED CLUB, coming from Aladdin/Simon & Schuster in October, 2019! Riley Dunne loves being a member--and leader--of the Red Club. It's more than a group of girls supporting each other through Aunt Flo's ups and downs; it's a Hawking Middle School tradition. The club's secret locker has an emergency stash of supplies, and the girls are always willing to lend an ear, a shoulder, or an old pair of sweatpants. But when the school administration shuts down the Red Club because of complaints, the girls are stunned. Using skills she cultivated as her school paper's top investigative reporter (okay, only investigative reporter), Riley digs for the truth about who shut the club down and why. If that weren't enough, she also must deal with her best friend, who is acting super weird as of late; a new and ridiculous dress code; and trying to make sure the group remains focused on fighting back, rather than fighting with one another. 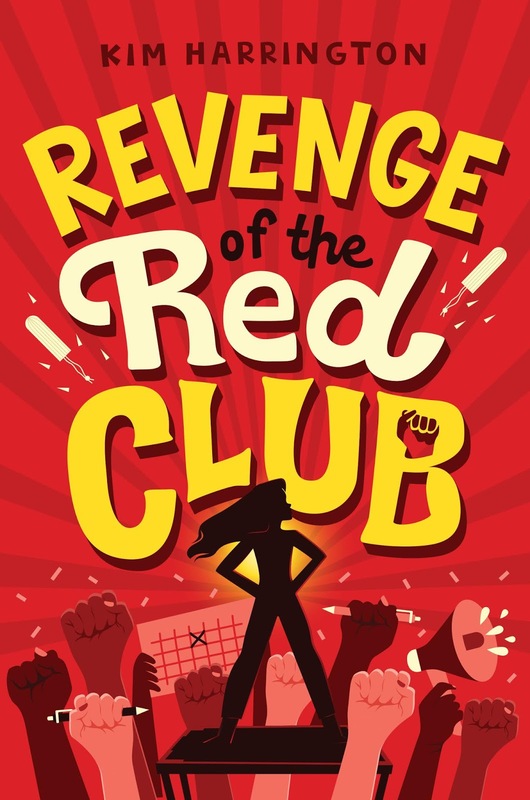 With humor, heart, and lots of period power, Riley and her friends rely on surprising allies--and their own strength--as they work to save their club and stand up for what they know is right. Many times, authors will have a vision in their head of what their cover should look like. But with REVENGE OF THE RED CLUB, my mind was blank. How was it possible to convey in one image that this book had humor, heart, girl power, and, um…lots of talk about periods? I wouldn’t even know where to start. And that’s why I’m a writer and not a designer. Thankfully, Aladdin’s Tiara Iandiorio is brilliant. She designed the perfect cover for this book. It blew me away. The bright red. Riley’s strong pose. The fists with pens. The calendar. And, of course, the tampons. 😊 I am delighted with this cover. And I can’t wait for readers to meet Riley and her friends! What do you think? We love the bright red color and Riley's triumphant pose. Congratulations to Kim on a gorgeous cover! We can't wait to see inside! 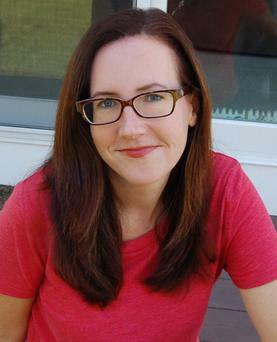 Kim Harrington is the author of Clarity, Perception, The Dead and Buried, and Forget Me for teens and the Sleuth or Dare and Gamer Squad series for kids. She lives in Massachusetts with her husband and son. When not writing, she's most likely reading, watching one of her favorite TV shows, or fantasizing about her next vacation. Thanks so much for hosting my cover reveal! I'm so excited to hear what readers think!